This is where we preview games that tickle our fancy. The previews cover demos, videos, and screenshots of games that are in development. Our previews are opinions and commentary about what we think should be changed/fixed about games as well as parts of games that we really like so far. This is the latest version of Starcraft 2 that Blizzard is developing. This is the newest alpha version which has missiles that people "don't know how to deal with yet." I am a moderate Starcraft fan and the level of competition in playtesting is already high. The second part is after the click. I like cartoony and stylized, so naturally I was excited when battlefield heroes was announced. Similarly to Team Fortress 2 this game successfully pairs cartoony slapstick action with exploding gore to the delight of many. With the added feature that this is a free to play game and the developers earning their income through ad sales and the sale of in game clothing options. This aspect added a bit of skepticism to how successful this game would be, however I can say that there is nothing to be skeptical about and Dice brings it all the way through. 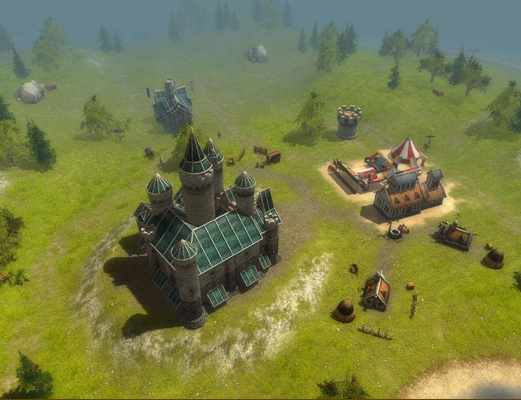 I’m guessing that not many people have played the best selling game RTS Majesty: The Kingdom Sim when it came out in 2000 on PC. The game was unique in that the player does not have direct control over their units, the only way to influence their actions is through reward flags and exploration flags. Majesty 2 is a game that I have high expectations for since I am a huge fan of the original and expansion pack. I have faith in the new company Paradox Interactive in retaining the glory of the original. This is a preview of Resident Evil 5 after my hands on time with the demo. As with all previews, I am going to talk about what happens and people should be aware that there are going to be spoilers from the demo. I assume that people have played Resident Evil 4 but not everyone has played the RE5 demo. So if you haven’t played the demo, I would play it first if you can before you read the preview.